Before getting bitten by the homebrew bug, my in-the-apartment creativity was centered around cooking and general culinary arts. 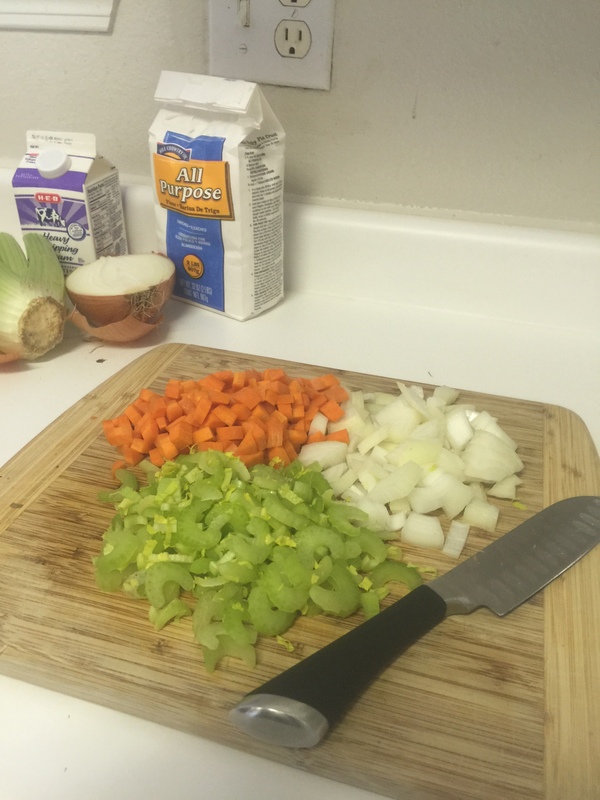 From vegetarian/vegan cooking experiments to ice cream making, I enjoyed focusing my efforts on the wide spectrum of cooking areas and techniques. Recently, looking to change things up a bit, I thought I’d combine these two passions into the aptly titled “Homebrew + Cooking” series, combining a recent homebrew with one of my favorite dishes. 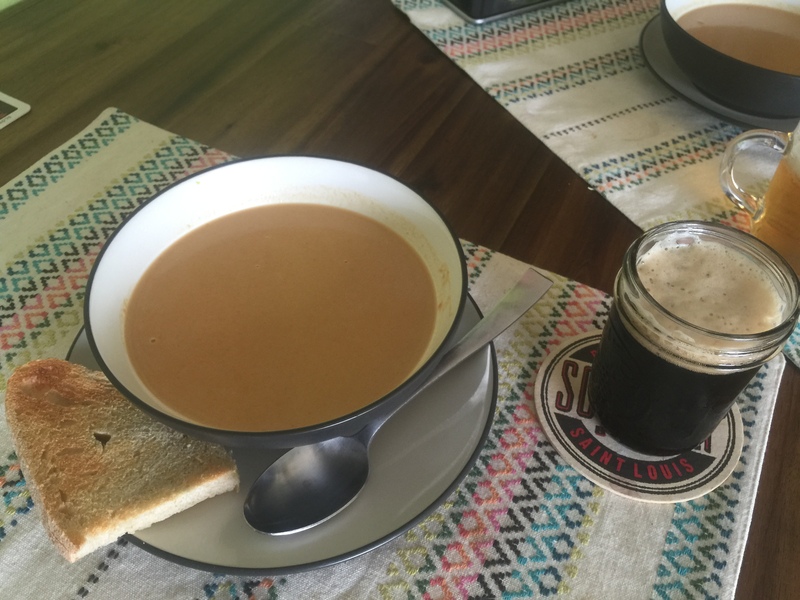 Just in time for St. Patrick’s Day, I’d thought I’d launch the series by combining a stellar (frequently brewed) homebrew with a favorite soup recipe: Smoked Porter Cheddar Soup. quick note: for the TL;DR version, see the recipe summary below. As detailed in this update post linked here, I was initially inspired while visiting Stone Brewing World Bistro & Gardens outside San Diego in 2014. 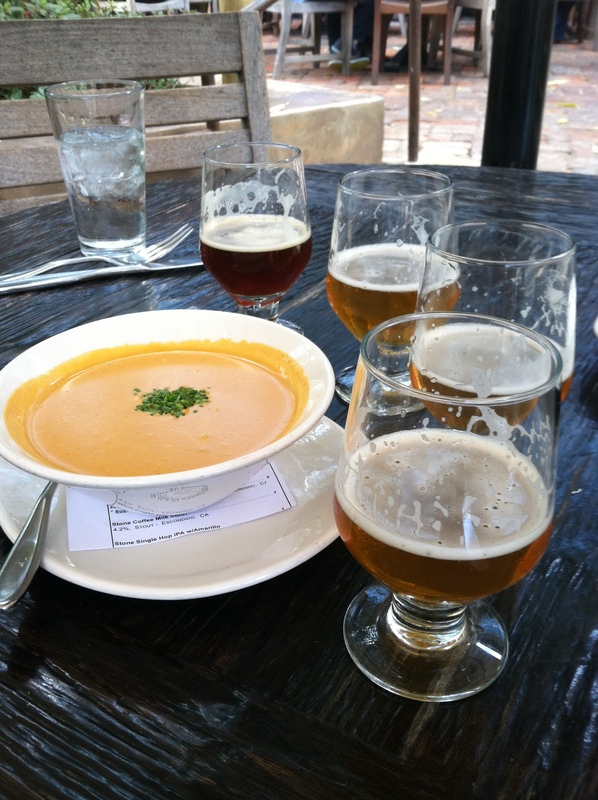 As pictured, one the menu items was a beer cheddar soup made using the original Ruination IPA. Beyond its standard cheddar soup vibe, it had an interesting hint of hop bitterness that melded will with the sharpness of the cheddar, all of which made a perfect pairing with a flight of Stone brews. Upon returning from San Diego, my first order of business was to replicate this fantastic soup. However, as most homebrewer do, I thought I’d build on its general idea and change a few things up more suited to my preferences. The main change was using smoked porter instead of an IPA as the beer component. The goal here was to meld the chocolate, toffee, bready, nutty qualities of a porter while adding a hint of smoke, all of which (I think) pairs well with aged cheddar. 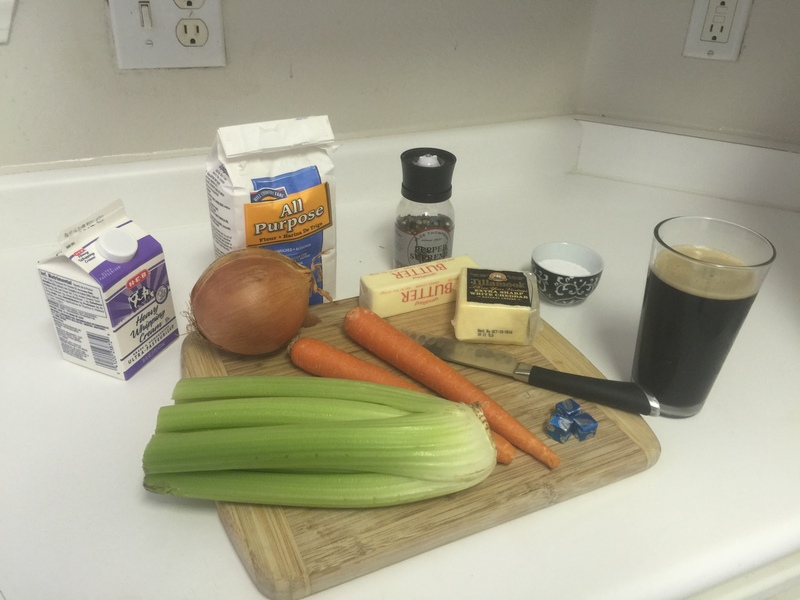 Most homebrew smoked porter recipes will work in cheddar soup. In general, I think the smoke-forward versions (aka smoke bombs) work better with cooking since the smoke component has to compete with the character of the other soup ingredients (including the cheddar) to be apparent. Also, the type of smoke character of the smoked porter is up to taste preferences. In my smoked porter, I prefer German Rauch malt, a beechwood smoked malt, which lends a smooth, bacon-y character to the porter and indeed the soup (who complains about anything bacon flavored right?). In terms of recipe specifics, a good start is Jamil’s in Brewing Classic Styles and is essentially my base recipe except for a reduced portion of crystal malts. 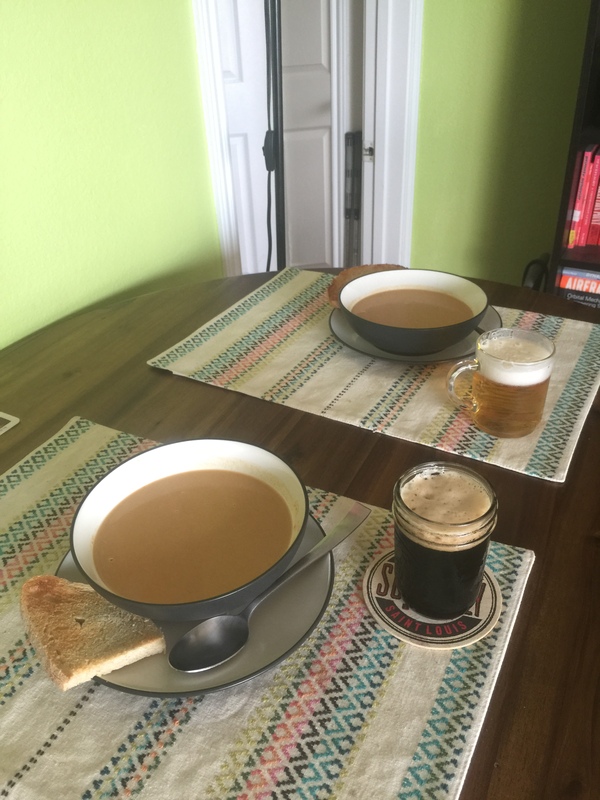 For this particular iteration of the homebrew (and soup), I used an imperialize version named Imperial Smoked Porter, which is essentially the same recipe documented above, except upping the Rauch malt to ~50% of the grist, getting the original gravity in the 1.080 SG spectrum. Quick advice for the extract brewer: Rauch malt is a tough one to find in extract form. If sourced, just substitute Rauch malt accordingly in the recipe above. Better yet, consider performing a mini-mash to extract the fermentables in the Rauch Malt (see IG:Homebrewing Parts 6&7 for more info). Need a commercial substitute? No homebrew on hand, no problem! You can easily sub-out any commercial (preferably craft) brewed smoked porter. Also, in a pinch, any roasty/dark beer style works as a good substitute. Here’s a short list of interesting and typically accessible commercial recommendations: Alaskan Brewing Co. Smoked Porter (any vintage), Stone Brewing Co. Smoked Porter (preferably without the vanilla). The key to a good beer cheddar soup is to keep it simple, without going too crazy on spices/seasonings/etc. Since the key character is derived from the beer (in this case smoked porter) and aged cheddar, anything on top of this will likely and overcomplicate/mute these core ingredients. Also, while the list of ingredients below are fairly basic (most of which you may already have in your kitchen), I listed some additional details to think about while building your recipe. unsalted butter, roughly 6 tbsp (3/4 stick); standard supermarket brand butter will do. equal parts chopped celery, onion, & carrot (aka mirepoix), roughly 1 cup each. Since most intermediate brewers have some sort of scale, this equals to 4 oz of celery, 5 oz of onion and 5 oz of carrot. flour, roughly 1/4 cup in volume; this will form a rue with the butter and chopped veggies. veggie/chicken stock, approximately 20 oz in volume; vegetarian company will appreciate the veggie stock option here. a bottle homebrew (or commercial equivalent) smoked porter; make sure you have another bottle to pair with the meal! heavy cream, roughly 8 oz in volume; any supermarket brand will do. aged sharp cheddar, 6-8 oz the amount of which depends on the intensity of flavors of the particular cheddar and your overall taste preferences. In my recipe, I used a very strongly flavored 3 year age cheddar from Tillamook Dairy Co-op, and only needed 6 oz to yield the cheddar intensity in the soup. standard cooking sh*t: large stirring devices, measuring cups, spoons, knife, cutting board, etc. For those who’ve made soup before, this section is not necessary. However, for those giving it a first go-around, here is a list of directions with photos. Cheers! Chop up the veggies. Small pieces. Mine are not super uniform, but this works empirically; they going to be blended into a purée later anyway. 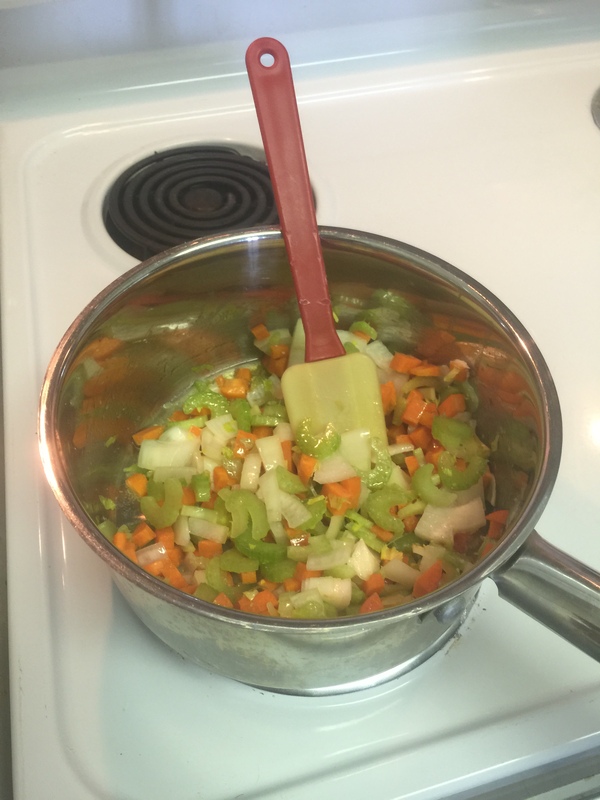 Melt butter in suitable pot and sauté the chopped celery, onion, and carrots over medium heat until tender. Make sure not to brown the veggies, just soft and somewhat translucent. This take approximately 5 to 10 minutes depending on how “medium” your heat is. Add flour to pot and stir for 3 to 4 minutes over medium-low heat to form the roux (this will help thicken the soup). Make sure to constantly stir the mixture during this step. Stir in beer and broth making sure to mix thoroughly. The pot at this stage can get foamy, especially when adding the beer, so watch out for any boilover situations. Bring mixture to boil. Once at boil, reduce heat to a simmer and cook, stirring occasionally, for 30-45 minutes or until suitably thickened. I usually like my soup on the thinner side, so I usually aim for 30 minutes. Also, while you’re waiting during the boil, you can slice up the cheese into small pieces. If you have a cheese grater, use it; mine is currently out-of-commission. Turn off heat and puree until smooth. Notice the before and after; very smooth. Stir in the heavy cream and cheese. 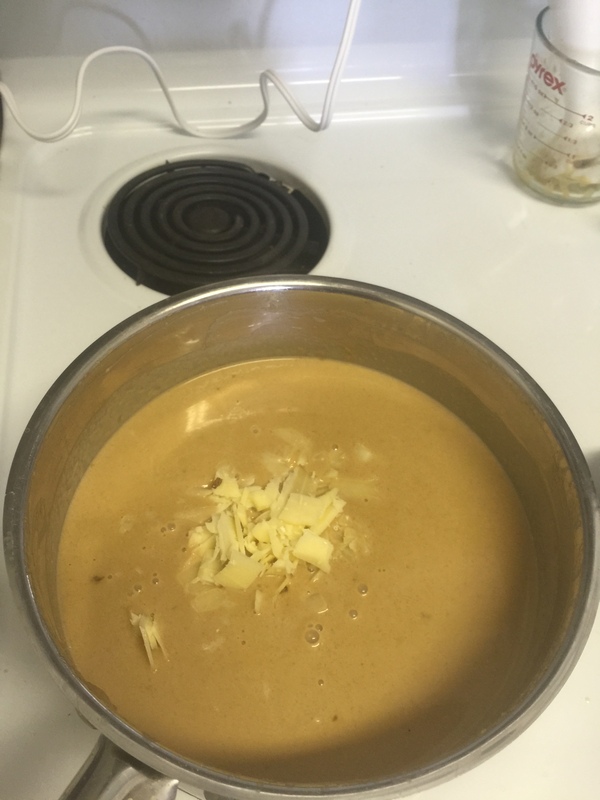 Add heat if necessary to melt the cheese, but avoid bringing the soup above a simmer; this will denature the proteins in the cheese, turning the once creamy soup into a grainy mess. Trust me, I’ve been here before unfortunately. Season with salt and pepper as desire and serve. Remember to pair with your homebrewed smoked porter. Cheers! A creamy, sharp, slightly smoky cheddar soup feature aged cheddar and a homebrewed smoked porter. Melt butter in 4 quart pot and sauté the chopped veggies over medium heat until tender for 5-10 minutes. Add flour and stir for 3-4 minutes over medium-low heat to form the roux. Stir in beer and stock; mix thoroughly. Bring mixture to boil and reduce to simmer, for 30-45, stirring occasionally. Turn off heat, and puree until smooth. Stir in cream and cheese. Season with salt and pepper as desire, and serve. Pair with your homebrewed smoked porter. Cheers! 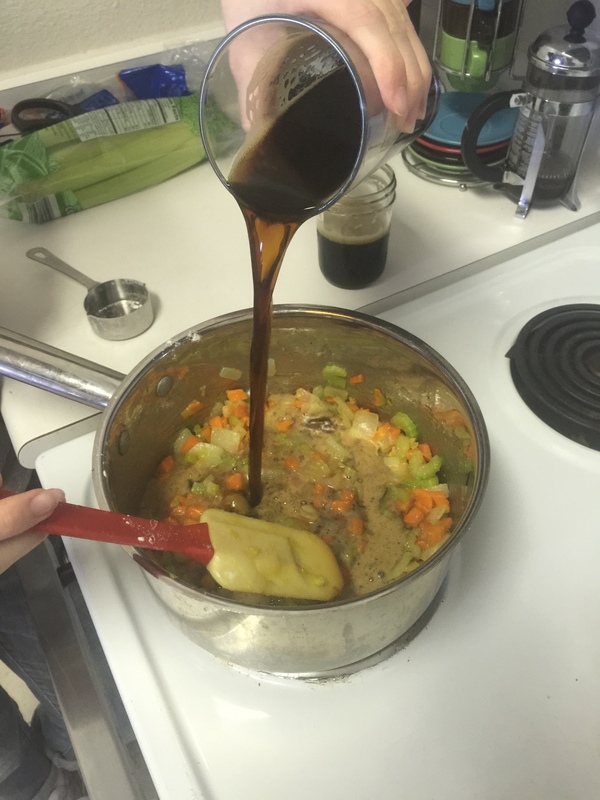 Do you have a favorite beer soup recipe? Share your experiences in the comment section below. As always, cheers and happy brewing! Check out my book: The Idiot’s Guide to Homebrewing! Congrats on the book. Are you a vegetarian then? Thanks! Also, mostly vegetarian. I think technically I would be considered pescetarian since I eat fish on occasion. Nearly all of my recipes are veggiesaurus friendly. Cheers!